For those who enjoy Sega genesis and Mega Drive era. You have the chances to re-own/re-live playing on your TV once more. Sega is releasing the retro looking Mega drive game console once more. 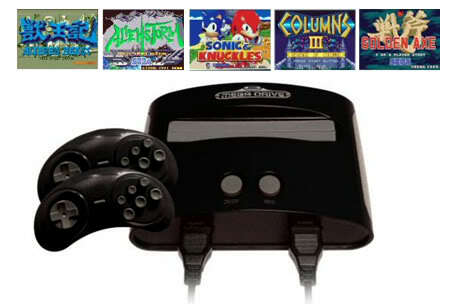 The main console come with 2 controllers, 15 built-in games and a slot for Mega Drive / Genesis cartridges. Too bad you can't choose what game to be in-built inside. It is expected to be release on 24th April 2009 for around $50 USD. If you really like to buy one, you can get it here. Will you buy it? Which is your all time favorite game in Sega? This kinda reminds me of this one time when I was in Akihabara, and I saw this chick buying a SNES system and a couple of old Dragon Quest games. If I knew any Japanese, I would have proposed there and then. I still have my Sega Megadrive 2, whether it works or not is another matter. Favorite game? Gunstar Heroes! My favourite is Shining Force 1 & 2. Super solid fantasy knight RPG ~ turn-based strategy game. ow i need to have it. and i found something for you mask search so please email me on konijn82@yahoo.com. Go search for it! If it works, let us know. The chick must be pretty hot I suppose? Bare Knuckle are good for 2 players. The woman was quite popular play choice. Shining Force 1 & 2 was my favourite too. I played the japanese as I do not want to wait. Moonwalker & Golden Axe were hot to the max at one point of time, even the demo used them.